Since 1993, Amacord, formerly E-Media, has provided advice and assistance to all kinds of businesses and organizations. In 1994, we sponsored the first conference devoted exclusively to the subject of commercial opportunities on the World Wide Web, featuring Marc Andreessen and other pioneers of Internet commercialization. Since then we've been involved in many other projects. 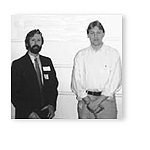 Left: Ken McCarthy organized and sponsored the first conference on the commercial potential of the World Wide Web (November 4, 1994) Right: Marc Andreesem, co-founder of Netscape. First conference on web's commercial potential.